Yuan Yang is a county located in Honghe Prefecture, Yunnan province, China, along the Red River. It is well-known for its spectacular rice-paddy terracing. 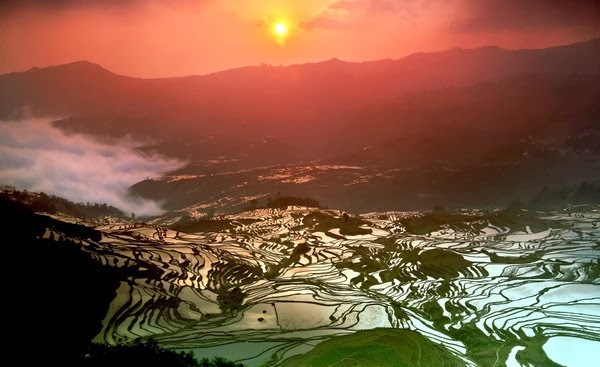 With terraced fields as the main landscape in Yuan Yang, Hani terraced fields is regarded as the core area, which is one of the 45th World Heritage Sites in China. Yuan Yang County lies at an altitude ranging from 140 along the Red River up to nearly 3000 metres above sea level in the Ailao mountains and is situated about 50 km north of the border with Vietnam. The majority of the inhabitants of the Yuan Yang County are from the Hani ethnic group. The town of Old Yuan Yang is a Hani minority settlement atop a ridge of the Ailao mountain range at an elevation of around 1570 m. It is a popular travel destination with photographers due to the vast areas of nearby mountains which have been cultivated into terraced rice paddies for at least the past 1300 years by the Hani people. Yuan Yang Terraces is regarded as the earth sculpture masterpiece of the Hani people and mainly consists of three scenic spots: Bada(坝达), Tiger Mouth (Laohuzui, 老虎嘴) and Duoyishu(多依树). Large acres of terraces form a magical magnificent landscape under the cover of white clouds. 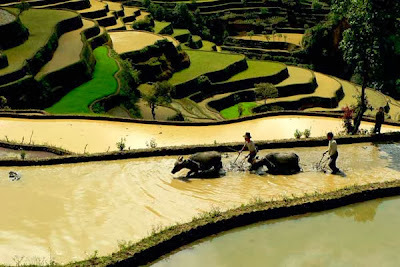 It is really a must-go destination for Yunnan tour. 1. 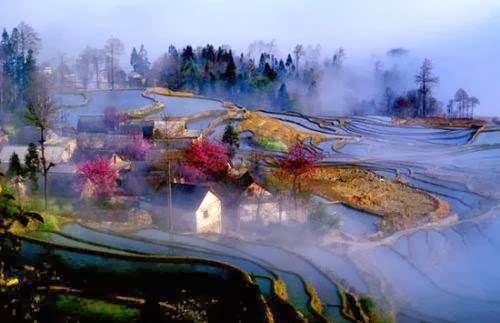 The best time to see the scenery of the terraced fields in Yuan Yang is from November to the following April. 2. Yuan Yang lies on the Tropic of Cancer, so the climate is neither extremely hot nor cold. However, it is cooler in morning and evening, and the sun is very strong at noon. You should pay attention to sun protection. Moreover, T-shirts and shorts can be worn all year round, but you are advised to take a jacket. 3. It is very interesting to participate in a local country fair, during which the entire minority people dress in colorful ethnic costumes.